Did the first month of 2012 fly by, or is it just me? Even with the extra day, January seemed to go by too quickly. 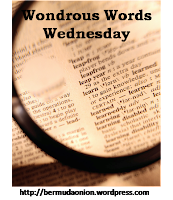 Often I recycle pages from my 365 New Words-a-Year calendar, and use them to jot down lists or notes; I saved a few words from January to use for BermudaOnion's weekly meme, Wondrous Words Wednesday. On the reverse side of each page there's additional information about each word, and I've included some of this as well. I joked with Annie that she was an extremophile, taking red-eye flights and pushing herself to the limit with her running regime. Because of their ability to live in extreme conditions, extremophiles may have a lot in common with the first organisms that appeared on Earth billions of years ago, and may give us clues about how life on earth developed. The abandoned shed near the transit center became a nidus for teenagers who smoked pot and drank beer after school. To scientists, "nidus" refers to a breeding ground as for bacteria . Although it means "nest" in Latin, the word often has negative connotations, as a source of or breeding ground for infection or undesirable opinions or habits, although variations of the word refer to homier places, such as "nidicolous", which means reared in a nest. Sastruga originates from the Russian word zastruga, which means groove or small ridge, and is not widely used in English. Sastruga is mentioned in the book The Worst Journey in the World by Apsley Cherry-Garrard, a survivor of the 1910 –1913 British Antarctic Expedition, led by Robert Falcon Scott. What new word discoveries have you made recently? Interesting words Suko. This is my first time reading these. Naida, thanks for taking the time to comment. I read your comment in my email, but for some reason I had to fish it out of my "Spam" box to post it here--I don't know why! These two words are new to me too!! Thanks for dropping by and commenting, much appreciated! Those are great words! I could use the first two. Not much use for the third word with our mild winter this year. I haven't come across anything new lately, but perhaps I should start looking. Yours are a good start. These words are all new to me! Last year on this date we had a blizzard and I could have used the word sastruga! January flew by for me too. All of your words are new to me. I'm glad I don't live somewhere that gets a lot of sastrugas. I was in that same blizzard a year ago and had a two foot high sastruga in the middle of my driveway. January has flown by for me too, probably because the weather has been so nice this year and I'm not stuck indoors. January certainly did fly by. You have three great words there. A very dear friend is an extremophile- I now realise! I knew nidus, and have seen a sastruga, but never had a word for it. I usually know at least one of these words but not so this time, each and every one is new to me. I have always wondered what those ridges of snow are called, and now I know the answer! Thanks, Suko for sharing these words with us! I love it when you learn a new word and then it starts popping up all over the place. Ages ago at work we did word of the day, one of them was "brackish" which we jokingly used to describe the work soup on a regular basis. Recently I've noticed it a lot when I'm reading and it makes me smile still.